1. Prepare a charcoal fire or preheat a gas grill for indirect cooking. Alternatively, preheat the oven to 375�F. 2. Stir the barbecue spice blend and cocoa powder together in a small bowl. Rub the turkey breast roast generously with the spice rub and the thyme leaves, turning the roast to coat all sides. Position roast on the grill with a drip pan underneath if desired. If roasting in the oven, place roast on a rack in a shallow roasting pan. Grill or roast until a meat thermometer inserted in the thickest part of the roast reads 165�F about 45 minutes on a grill or 60-75 minutes in the oven. Remove roast and let rest, covered with foil for 15 minutes before slicing. 3. While turkey is roasting bring 1 quart of water to a boil in a medium saucepan. Add salt and rice and boil, uncovered for 10 minutes. Drain the rice in a colander briefly, leaving the rice wet. Return to the empty saucepan, cover with a lid and place it back on the burner over very low heat. Steam the rice in the water that remains on the grains for 20-25 minutes until tender. Toss the rice with the herbs. Keep warm. 4. Add 2 tablespoons cocoa to the barbecue sauce and simmer, stirring occasionally. Add additional cocoa to taste. 5. 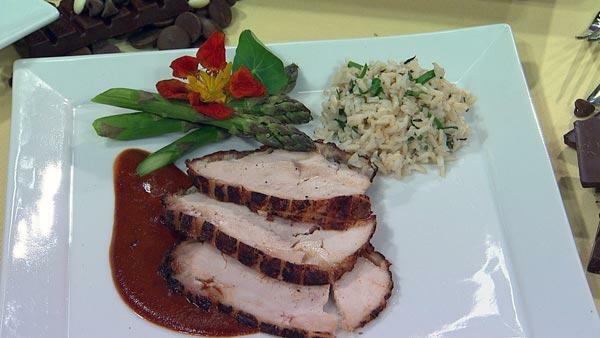 Slice the barbecued turkey and serve it with the herbed rice and sauce. 6. Recipe note: To make your own spice blend mix together 1 tablespoon each of ground black pepper, ground cumin seed, brown sugar, white sugar, pure chile powder (such as ancho or New Mexican) and two tablespoons of sweet paprika; along with 1 teaspoon salt. Measure 2 tablespoons spice blend for the recipe.